This past week, I have been in the UK again, mostly for my Mum’s birthday. We had a lovely weekend, starting with a bracing walk around the old English towns of Burnham on Sea and Weston Super Mare. Unfortunately, we also went on days when almost the entirety of both towns were closed, probably due to the weather. We still managed to have some lovely fish and chips, and an ice cream. And a poke around the end-of-pier arcades, but that really was mostly to get out of the wind for a bit. Last week, I also noticed that Liz Knight of Forage was going to be doing a family forage at the Tudor Farmhouse Market in Clearwell in the Forest of Dean. As that is pretty close to where my parents are, and it is a beautiful place to go, I cheekily asked if they would take a family with grown up kids. When they kindly agreed, I had a plan for Sunday too. We enjoyed a short walk around the grounds of the hotel, and picked up loads of delicious treats, and all of us learned about things that we didn’t know were edible. There were also local food producers and a folk duo playing live. As you know from yesterday’s post, Liz has been very helpful over Twitter, so it was lovely to meet her in person. She is so enthusiastic and knowledgeable, as well as being great with all the kids that came. She kept everyone engaged on the walk. There were bread and syrup making demonstrations afterwards, using our bounty. 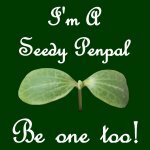 Liz runs a number of foraging walks and classes, so you could look out for them, I guarantee that you will learn a lot. We also had a barbecue for Mum’s friends and family. I was happy to lend a hand with home-made burgers, salads, and dips. Many of them will appear here soon, but I have so many things to post that they may be over the course of a few weeks. The important thing is that she enjoyed herself, and there were actually few leftovers. This is a good thing, but you do know how I love using up leftovers. My dad had baked a salmon, and there were a few new potatoes that we had cooked up in their skins, in water with a few mint leaves in it. We served these simply in butter. What better way to use these ingredients up than to have fishcakes? This is also my entry to this Month’s No Waste Food Challenge, hosted by Turquoise Lemons. For June, Kate is challenging us to produce a recipe using leftovers of any kind. This entire meal was to use up the leftovers from the barbecue, with only the addition of freshly cut herbs for the fishcakes, so it definitely qualifies. 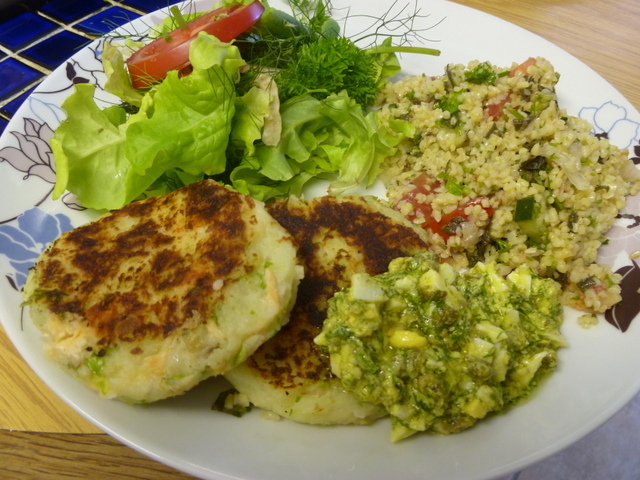 I served the fishcakes with tabbouleh, sauce grib-ish, and a fresh salad. A perfect way to round up a birthday weekend. And at last the sun had arrived, so we ate this meal in the garden. 1 whole salmon*, gutted and cleaned. Check that the salmon will fit into your oven, on a baking sheet. If you are having problems, then you can remove the head or the tail, or both. I like to leave the head on if I can, the cheek meat is the cook’s treat. Pre-heat the oven. Dad just says a low oven. I would suggest that this is no higher than 160°C. Place the herbs and the cucumber in the cavity of the fish, and season to taste. Brush the fish with butter, then wrap it in foil, as you would for cooking en papillotte (the parcel making starts at 2.16). Place the parcel on the baking sheet, and cook in the oven until the fish is just done. Exact times will depend on the size of your fish. As a guide, our fish was 1.3 kg and took about 40 mins in a low gas oven. This gives a lovely, moist fish, that is delicious hot or cold, served on the bone. As this is intended to use leftovers, this is more a guideline than a recipe, so I have listed the ingredients, but not the amounts, use up what you have. The next day, I had about 7-8 new potatoes (not the really tiny ones). I peeled them, then heated them up in the remainder of the butter. New potatoes are not the best kind to use for mash, but when they were warm, they mashed really well. I added a scant tablespoonful of cream cheese to help bind it. Horseradish cream would also have been great, but my Dad won’t eat that. Remove skin and any bones from the salmon, and flake it into large chunks. Mix the mashed potato, fish and herbs, until they are well combined. Form into patties by rolling balls in your hands, then flattening and shaping on a chopping board. I had worried that the new potatoes wouldn’t mash too well, so I was going to coat them in breadcrumbs to help. As this wasn’t needed, I decided just to fry them in a little oil until they were browned on both sides. 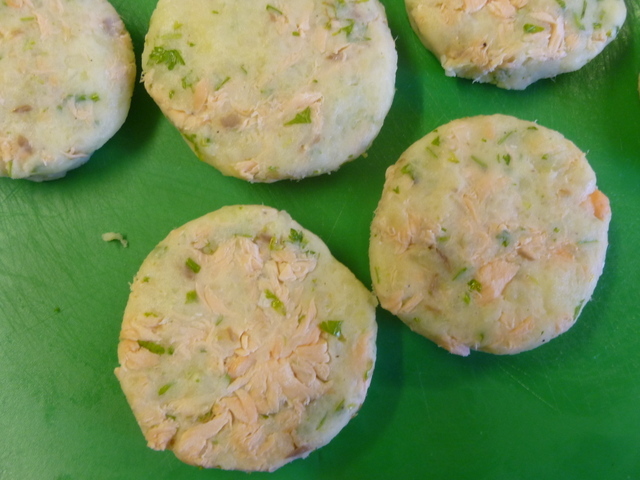 These fishcakes will keep in the fridge for a few days, and they also freeze well. *When sourcing a salmon, due to recent overfishing, it is better to get a farmed one. Fish farming can have serious environmental issues, particularly where the fish are fed other fish by-products and are routinely fed antibiotics (mostly required in overcrowded nets). In order to avoid this, please look for organic farms, that feed a plant-based diet. This is what the Marine Conservation Society have to say on the issue. NB: This is not a sponsored post, I mention Forage and the Tudor Farmhouse because I really enjoyed the experience. These sound delicious… pleased to hear you had a lovely visit back home, I am inspired to have fishcakes now… I have a whole fish in the freezer from Mr BE’s most recent fishing adventure (caught by his own hand), I shall be cooking that in the next week and will be sure to have leftovers to make a few patties! Hey Brooke, thanks for dropping by.